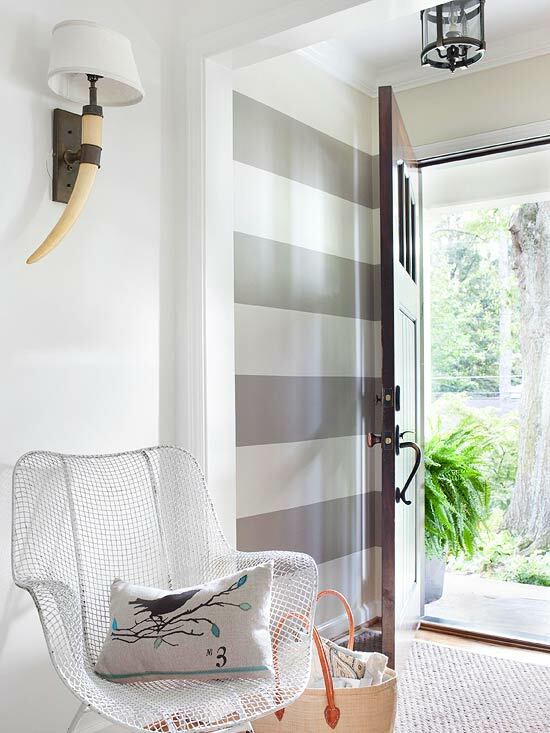 My entryway would have been perfect for stripes. See? That back wall was screaming for some interest. 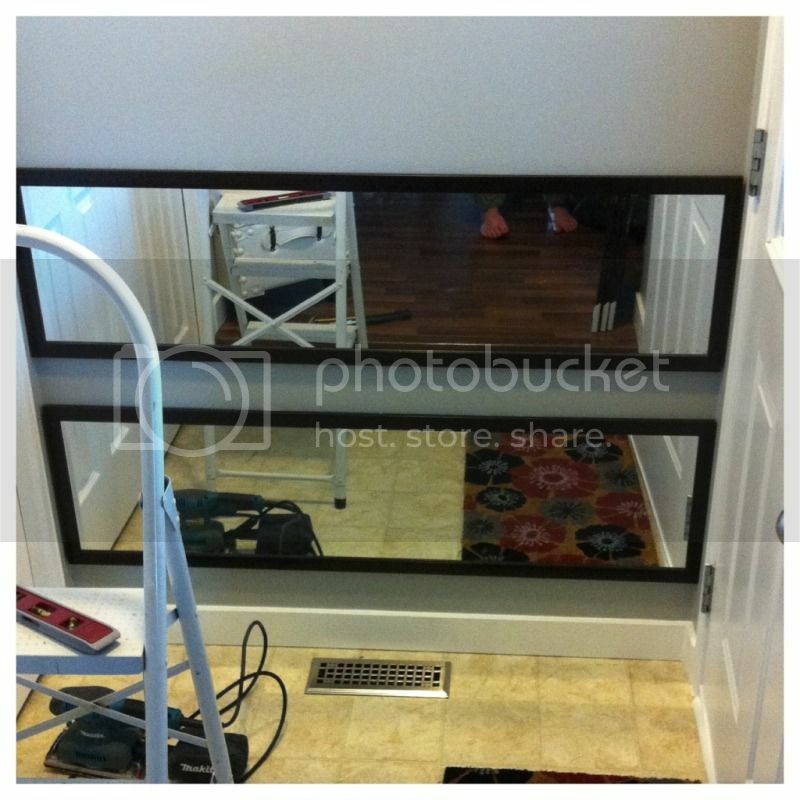 However- I have a bit of a thing about entryways: they NEED a mirror. Nothing bothers me more than standing in an entryway needing to check my makeup (I swear I'm not as high maintenance as that makes me sound) and having nowhere to do so. Entries and exists need mirrors! And I have another bit of a thing: I hate it when people hang something on a wall with stripes. I don't like my stripes interrupted. 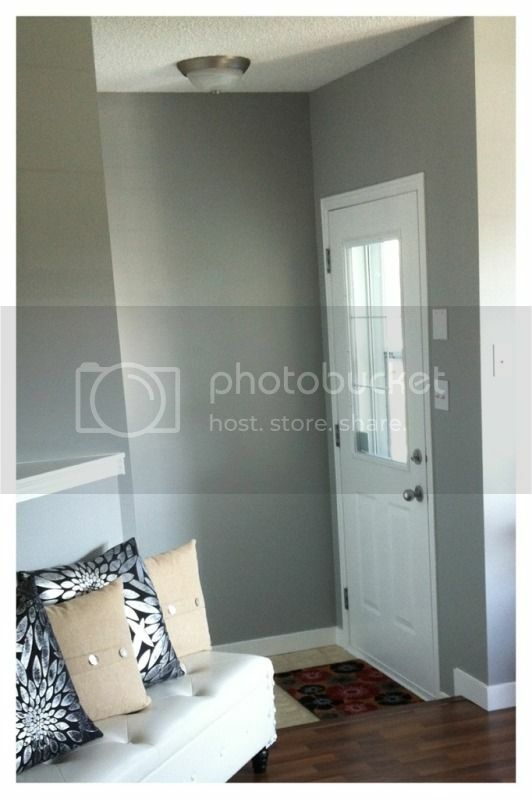 The stripes themselves to me are the artwork for that wall. 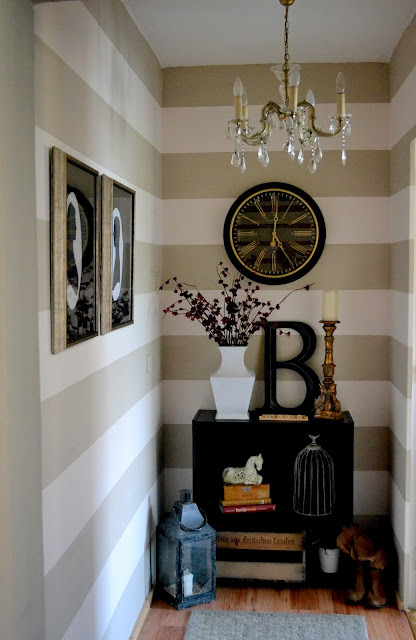 So together that kind of put the kibosh on my striped wall- because there is nowhere else in that entry for a mirror. The wall you can't see that faces the front door there is a big double closet- so that wasn't going to work out. PINTEREST TO THE RESCUE!! I know, I don't seem to have an original idea in my head do I? But I adore looking at Pinterest, and while a lot of the things I pin are just for inspiration or cause I like the look but will never actually use- sometimes I strike upon a gem that I can feel in my bones NEEDS to happen in my house! (Like the brown paper flooring.) And this was one of them. This is apparently an image from InStyle Magazine February 2008, featured on ApartmentTherapy. I've just recently started following Apartment Therapy on a regular basis (thanks to Flipboard on my iPhone), and in February 2008 I was living in Toronto working as a part-time babysitter and full time student. Were it not for Pinterest I would NEVER have found this image. But as soon as I saw it I knew it- THIS was the solution for my entryway!! And when things are meant to be, they're meant to be. Once my Mom and I had painted the entryway and livingroom I was describing my plan to her over tea and perusing the flyers for that week- and I saw that XSCargo (like an overstock store) had full-length mirrors on sale. And upon measuring the wall and referencing the measurements in the ad- they were the same! Hallelujah!! So I gleefully brought them home, ripped the little cardboard corners off, and attempted to put one in. PROBLEM! XSCargo lied! (Shocking, I know- you should be able to trust the measurements given in a discount overstock store's flyer!) 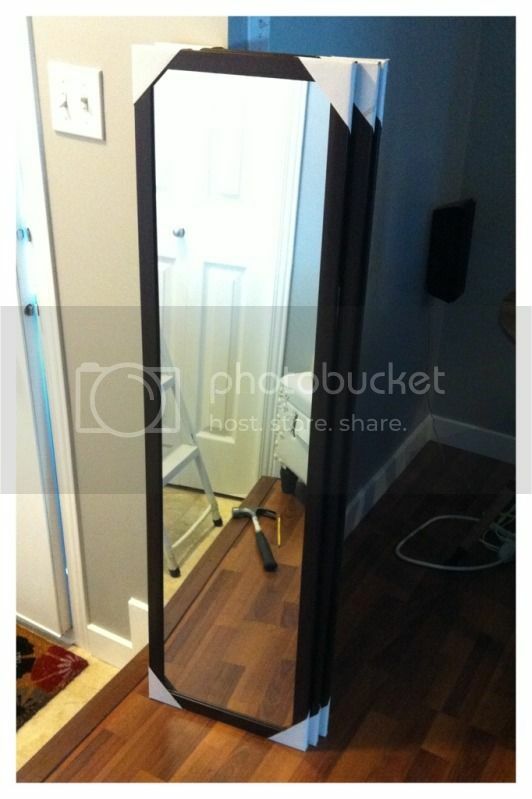 The mirrors turned out to in fact be 1/2 an inch bigger than the space I wanted them to fit. But again- my mother was there with words of wisdom: "Just sand them down!" So I did! This was not a pleasant process however- those frames, though they look like wood- are some kind of plastic. They DID sand down relatively easily, however they produced a buttload of dust and were difficult to keep stable. Slowly but surely, I sanded each one down a quarter of an inch on either short end. I figured it doesn't matter if the ends aren't finished- they'll be butting up against the wall. So once that very tedious job was over (if you decide to attempt this please wear protective eyewear and a mask! You don't want to inhale plastic dust!) I wiped them all down (see comment re: dust) and got to installing! Well- after I'd loudly yelled through the house "HUBS! I need you to come measure and do math for me!" and had Hubsbeast measure the height of the wall, measure the width of the mirrors, and divide it up for me. I just attached the mirrors to the wall using 3M picture hanging strips. The small (or they call them medium- I've never actually seen smaller ones) size. Two on the upper side, one in the middle on the bottom- just like the package says. (EDIT: about a week after installing the mirrors, they all came crashing down. 3M strips were not enough! The top mirror broke, so I had to buy a replacement and sand it down again, and this time installed them with 3M Heavy-Duty 2lb per inch velcro. Between the 5 mirrors I used the entire roll- which I cut up into 1 inch squares. They are now firmly up there!) Then Hubs helped support the mirror while I lined up the bottom with my marks on the wall, and pushed in when I told him. I then touched up the paint on the wall and the trim that I destroyed while shoving the mirrors in. DONE! I love it!! It does exactly what I wanted it to: add interest to the small space, add a bit of drama, and give me a mirror (in multiple) by that door! Every time I walk by it I can't help looking at it. It also has the unintended but very nice effect that if I'm standing in the living room looking at myself, one of the gaps hits exactly at my torso. Fat day friendly!! I found your site through Pinterest (ironically!). Thanks so much for the info in this post. 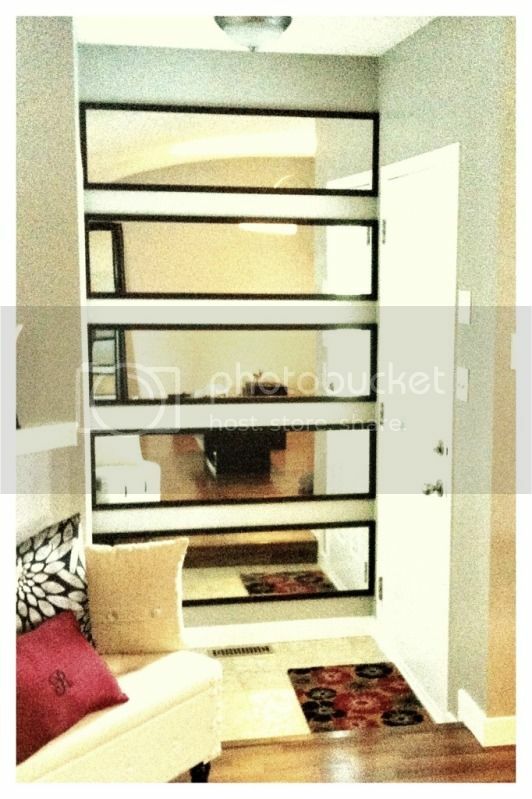 I'm moving to a new apt and desperately want the "horizontal mirror look". Since I'm renting, do you think I can use the same 3M picture strips that you used at first, but just double the number of strips used? I don't want to have to paint when I leave the apartment. Thanks! I think you probably could, depending on how heavy your mirrors are. I would use the bigger strips though (I believe I used "medium"- go large!) and I would probably double or triple up- again, depending on how heavy your mirrors are. I'd also make sure you clean the wall you're going to be attaching them to with a degreaser like TSP (which you can buy at Home Depot in granulated form for like 2$ and mix it with water to your desired strength at home) so that there's nothing to prevent your 3M strips from adhering. It occurs to me that I put to-small strips on a freshly painted eggshell finish wall and that probably didn't help. Let me know how it goes! It's definitely been a conversation starter in our home. I move in April so I will update once I put the mirrors up. It will be the very first project I tackle. Thanks for the response! Thanks for the idea! I am doing a 3 mirror display over a small bar in the basement. Hoping they stay on the wall like yours finally did! Be alert though...I've attached every kind of 3M product to these mirrors on doors etc and they will come down in the middle of the night and scare you to death! But I always have extra in the house.